Yowzers! I am finally back in the office after six days of travel. This is about 25% of the mail I have to open and review. The pile of boxes on the bottom left really is a stack of mail and boxes piled four-feet high. And in the top left is an in-box piled over two-feet high. Ugh. It was a productive but hectic travel time with lots of forward progress made on the Otion II. We’ve narrowed down the top three choices. Erik (Otion Store Manager) will be headed to Seattle next week to finalize the new location choice. After that comes the hard part – budgeting, store layout design and signing for bank loans. In other Otion news, isn’t this gift basket cute? Otion tries hard to be an active part of our local Bellingham community, donating to an average of 5 to 10 events every month. This particular gift basket with a soapmaking bar party gift certificate is for Benefit X. This event raises money for four very worthy local non profits, including the Sean Humphrey House and the Bridgid Collins House. 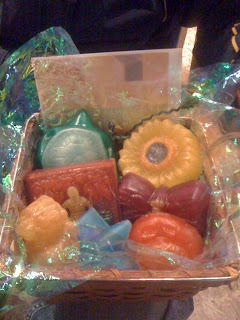 Jessica, one of our newest Otion Soapsters, made most of the soap, including the multi-colored sunflower, made with the Milky Way Sunflower mold, Cellini Yellow Lip Safe color and Cappuccino Mica. 1. Life isn’t about getting it all done. It’s impossible to get it all done. Give up on the myth that you can get it all done. You can’t. Life is about connection and moments. Creating little rituals with your family and friends to make sure that you have connection time is what makes life sweet. Some ideas she gave for creating connection time were creating a memory jar or interviewing a family member about their memories and experiences. 2. Life is even better when you can connect with your passion. What are you passionate about? Find ways to fit more of that in your life. When Mary was talking about finding your passion, I felt really lucky. I get to work with soap all day – and soap is my favorite hobby! In addition to what felt like a zillion meetings over the last six days, I also managed to stop at a Trophy Cupcake store in the Wallingford District. Based on the reviews on Yelp, I was exceedingly excited to go to the store. Their displays did not disappoint. The store was bright, friendly and had an open-air cafe design. I had high hopes. The Red Velvet cupcake called to me. Given my super positive experience with Red Velvet at Cupcake Royale, it seemed a no-brainer to get this life enhancing treat. The cheerful staff packed my cupcake in a painfully cute to-go box. It had a great little window for presentation and a sturdy insert to ensure cupcake transportation safety. Alone in my hotel room at 9:30 p.m. Tuesday night, I hunkered down for my prized dessert. One bite later, my hopes of a tantalizing treat were dashed. The Trophy Cupcake disappointed. It was bland. It was oily. It was in a word, “gross.” It certainly wasn’t worth the 300 plus calories in the cupcake, so with another small nibble to confirm the first impression, I put the cupcake back in the clever carrying case and went to bed with a heavy heart. The next morning, I saw the cupcake sealed up, lonely, in its case. It looked like it would taste good. So, like a fool, I opened up the box and took a tentative bite of the cupcake. What a horrifying reality; age did not improve this oily brick o’ butter. It was still gross. 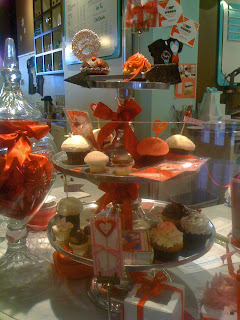 Sigh… what’s a girl to do but go get a cupcake that won’t disappoint? 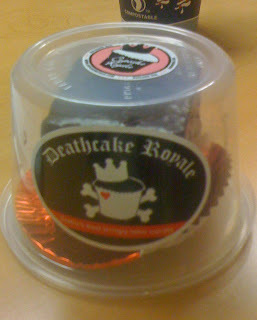 I headed to Cupcake Royale for a Deathcake Royale. Today is the last day to get them but if you like chocolate and espresso, these dense morsels of confentionary genius won’t disappoint. Warning: don’t eat a whole one in a single sitting. They’re meant to be shared. If you overindulge, you’ll go into a caffeinated, sugar induced haze that will leave you crashing (hard!) once the buzz is gone. 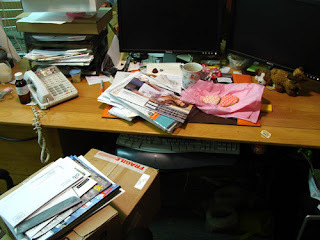 As for me, at this moment, I desperately need some more caffeination to help get through the mail and box collision that my desk has been reduced to. Oh no! 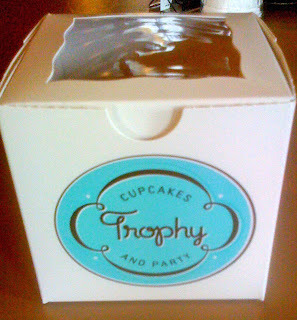 I have been wanting to try Trophy Cupcakes for ages, having not been impressed with Cupcake Royale. I’m so bummed to hear it wasn’t good. That’s the worst. Can’t wait for the Seattle store! We love Bellingham but don’t get there often. Grey – I know! I know, tossing a cupcake is such a travesty. I mean, of all the awful things to do … sigh. But yes, Cupcake Royale did manage to make life a little sweeter for me. In-Between – That’s great that you got to hear Mary speak also. Did you end up doing a memory jar or anything? I’m so glad that you were able to hear Mary Loverde speak – I saw her years ago at a Silicon Valley Women’s Conference and she was very inspirational. Sorry to hear about your cupcake! What a bummer when you mouth is all ready for some red velvet goodness! 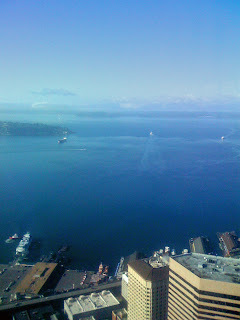 Oh, Puget Sound…I miss that area. Great photo of a gorgeous view. What a bummer about the icky cupcake. Glad there was Cupcake Royale to the rescue, but what a shame the Trophy one had to be tossed. The problem with Red Velvet cake is that it’s either very, very good…. or it’s horrible. I’ve never found one that’s just “ok”. There were only two sources in Jacksonville that I trust aren’t going to mess it up…and one of them has retired. The other is a very small bakery on the other side of town, and you have to order in advance, but it’s worth it! And as for that Deathcake Royale…looks scrumptious! The comments about the crash though? Sounds like you know from personal experience..
lol, oh, I know that caffeine crash you speak of all too well…i go through it everyday….and yet, i still can’t get myself to quit the coffee and sweets, lol! Wow, that deathcake looks amazing.